On 11th of September, 2018, “Amul – Hazar 2018” rally raid started in the administrative center of Lebap province. On the eve of the competition, the crews underwent administrative checks and technical inspections, reviewed the course and received the race map containing the route list and the map of the area crossed by the rally course. Under the regulations of the rally raid, the parc fermé with restricted access was created in the paddock where the crews brought their vehicles early in the morning. Embarking on their journey towards the starting line, the participants began preparations for the prologue, a qualification round that determines the starting order at the first stage of the rally. The prologue covers the distance of 9 km. President of Turkmenistan arrived at the venue of the official start of the race where the crews, technical staff, event organizers and supervisors, reporters and numerous guests gathered. The Head of the state opened the prologue, racing with number 100 on his sports car along the special track to once again demonstrate his brilliant driving skills. And here to the finish line of the special stage one after another cars come. The crew at number 100 came first. 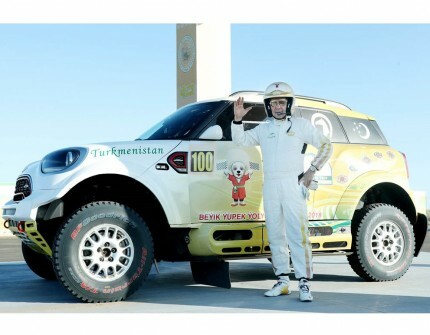 Then President Gurbanguly Berdimuhamedov spoke with the director general of the Africa Eco Race who was involved in implementing the “Amul – Hazar 2018” project, Jean-Louis Schlesser. After the qualification race, the competition’s first stage the length of which is 247 km began. The cars of the participants of the rally, which is 83 crews, took their places at the start of the first high-speed section and soon set off at an equal interval.